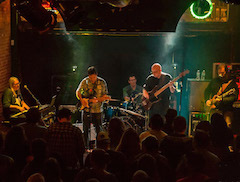 Gratefully Yours has quickly established itself as one of the Northeast’s premier Grateful Dead cover bands; with a truly all-star lineup and often performing "dream" set lists submitted by their fans. The band was founded in 2012 by Alex Mazur, (founding member and keyboardist of The Deadbeats… one of, if not the longest running Grateful Dead cover bands in existence). Along with a core lineup that includes Adam Czolowski (Sonic Garden), Tom Pirozzi (Ominous Seapods), Jeff Martinson (Shakedown) and Rob Schiff (Nailed Shutt), other honored members include Vinnie Amico (moe. ), Rob Eaton (Dark Star Orchestra), Russ Lawton (Trey Anastasio Band), Bill Carbone (Max Creek) and Zach Nugent (Cats Under The Stars). The Dead were a truly unique band and had a unique bond with their audience: Magic is what they did. Music was how they did it. Ultimately, it is that magic that Gratefully Yours aims to “cover” and pay tribute to. And taking it one step further, they also encourage their audience to participate further in the creative process by giving them the opportunity to submit their dream set lists (or vote for one) online and the band often chooses one to perform at their shows. But of course, you never know what might happen.